CIB: Current Interest Bond. Works like a fixed-rate mortgage. CAB: Capital Appreciation Bond. A series of Municipal Zero Coupon bonds with maturity dates in sequentially increasing years. Bond buyers may mistake Municipal Zero Coupon bonds to be the same as Corporate Zero Coupon bonds. In Rick's Piedmont Civic Association Oct 17, 2018 article he makes the following statements that I challenge or refute below. I copied and pasted his comments and have my own numbering. See his original article for additional context. The December 15, 2017 bond refinance was very tricky in that the original 2013 bond had a 10-year no-refinance clause. The refinance required creating a parallel bond with a trigger mechanism to pay off the 2013 CAB in 2023. Some of the savings from this refinance came from a change in interest rates but the bulk of it came from eliminating unpaid interest charges compounding from 2023 to 2043. I obtained a PhD in Computer Science in 1993. After teaching a year in college I switched to working in Finance and Technology industries as a Data Scientist. Since 2013 I have followed the District’s bond funding options, and provided oversight with detailed comments in emails and Board meetings. My articles can be searched on my HariTitan.com website using keywords: AHT, STEM, Kindergarten or CAB. 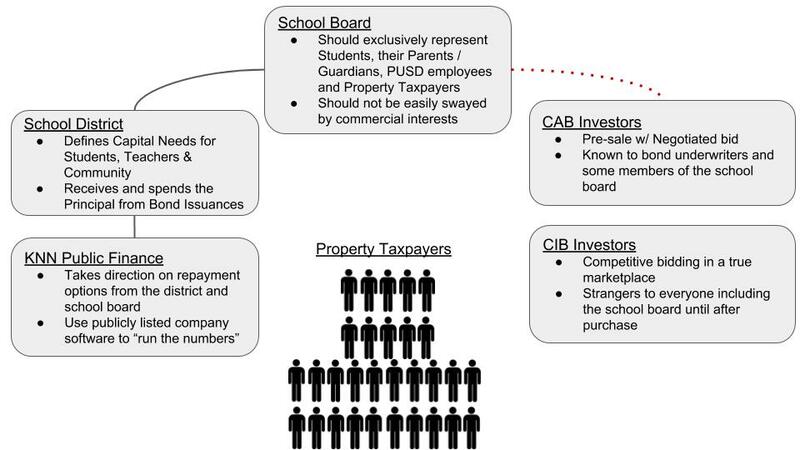 Over the 4+ years of attending school board meetings regarding bond financing I discovered various ways in which CABs were misrepresented to the public. I would like to congratulate the board in responding to the voices of the community who wrote into the board (roughly four years of lobbying later) to view the 2013 CAB negatively and allow for a refinance. However there are a number of issues relating to the process we went through that are troublesome. It requires the total assessed valuation for the school district and your individual assessed valuation as an inputs. It also requires the bond amount(s), the interest rates, the life of the bonds and the first year of taxation for the CAB as inputs. These inputs are in yellow. The School Board has taken to the idea that taxes can be deferred and reinvested to earn a safe return high enough to significantly discount the cost of additional interest charges. This safe return has been chosen to be between 3% and 4% based on a mix of long term Treasuries. 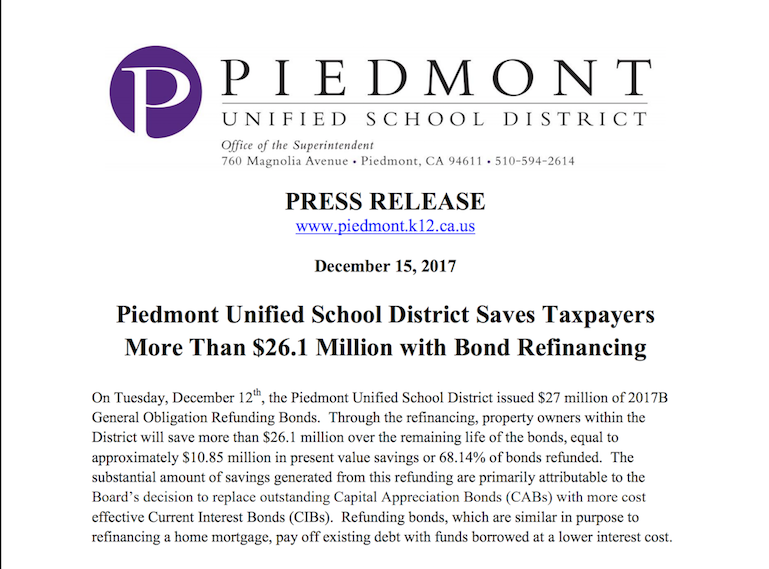 The School Board has asserted that as a result of this "discount rate", all financing options including CIBs, interest-only hybrids and CABs cost very close to the same amount! We question this assertion on a number of grounds. Last week's School Board meeting confirmed that all attendees enthusiastically support renovation of the Alan Harvey Theater. Now, much like buying a home, financing becomes front and center. Do I get a 30-year mortgage? Can I afford 15-year mortgage payments? How about "interest-only"? Can I delay payments until 2018? Oh wait, that last option isn't really an option for mortgages but is for School Bonds.